What is Hardwood Floor Cupping & Can it Be Reversed? It’s a lovely Sunday morning and just as your family is gathering for breakfast, something alarming catches your eye – your hardwood floor doesn’t look its usual pristine self. Upon closer examination, you realize the edges of the wood planks appear to be slightly raised. This commonly observed scenario is called cupping. Before you get rattled and try to amend the situation, you’ll need to get to the root of the problem and understand and mitigate the cause. But, what is hardwood floor cupping? It refers to a state when the individual wood planks appear to be higher on the edges as compared to the center of the board, forming the shape of a cup. Cupping is a result of the changes in moisture in the room. When the moisture increases, the wood swells and then when it decreases, the wood shrinks. As you can see, moisture and wood don’t go well together. Wood is hygroscopic in nature and thereby tends to absorb moisture from its surroundings causing problems in hardwood floors. However, this isn’t a reason to tick hardwood floors off your list. The good news is that hardwood floor cupping can be reversed, setting the planks back to their original condition. The first thing you must do when you notice a cupped floor is to identify the source of moisture. Cupping usually occurs due to increased exposure to moisture which can be a result of plumbing leaks, fridge leaks, or even an overflowing dishwasher that has gone unnoticed. Before you get down to repairing it yourself or calling a flooring expert, you need to identify and eliminate the source of moisture. It is a good idea to use a moisture meter to get an accurate understanding of the moisture content in the wood. If it is a case of minor cupping, which has been detected early, the floor is likely to go back to its original condition once the source of the moisture is removed. If not, you might need to call a flooring specialist to help you tackle this issue. Cupping can also be a reaction to the imbalance in the humidity level in the wood planks. Due to wood expansion during summer and contraction during winter, the humidity levels vary and that is likely to affect your hardwood floors. You can prevent this problem by controlling humidity levels in your home at all times, but what do you do when the damage is already done? Depending on the extent of damage, sometimes all you need to do is dehumidify your space. You can either invest in a centralized dehumidifier or a portable one. You can also turn up the air conditioner or keep the fans on to speed up the drying process. Dehumidifiers remove moisture content in the air and if you are lucky, a simple dehumidifying session might do the trick and help reverse the hardwood floor cupping. So, now that you have eliminated the moisture source and dehumidified your space, if you still see no change in your floor, the cupping as just as severe as before, then this calls for more serious action. At this stage, you should consider sanding the cupped portion of the floor. Sanding can help flatten the raised floor surface and bring it back to normal. After sanding, the floor is usually refinished to restore its sheen. However, do keep in mind that sanding is an extremely tricky process as it is important to consider the kind of wood and extent of sanding required. Hence, this process is better left in the hands of flooring experts because any minor glitches can lead to other problems, such as crowning, costing you even more. After all the above steps are taken, if your floor still hasn’t returned to its normal state, then you have reached the worst case scenario wherein the only solution is to get the floors replaced. If you have not yet, call in professional hardwood floor experts to restore or replace the exact size and length of the cupped portion of the floor. If the damage is extensive and has spread to other parts of the floor, you will need to get your entire floor replaced. At Wall2Wall, we are known for providing fast and effective repair services, regardless of the extent of the damage. Considering that no other remedy has helped reverse your cupping, it shows how serious an issue it is and calls for urgent fixing. While hardwood floor cupping can be reversed, it is a nuisance to manage. So, why not take precautions beforehand to prevent this phenomenon from taking place. One of the best prevention tactics is to control the moisture content and humidity levels in your home. Be mindful of internal leaks and don’t let them go unnoticed. You should also make sure the wood planks are properly installed and the moisture content is at the optimum level during the installation process. Hardwood floors need to be cleaned maintained, but make sure you use as little water as possible while mopping. Whether your hardwood floor is made of solid or engineered wood, it is bound to react to moisture so ensure you take the precautionary measures to prevent cupping. 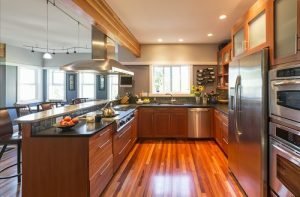 Let’s face it, even though hardwood floors have a long shelf life, it doesn’t save them from problems that occur due to climatic conditions, humidity, and excessive wear and tear. If you still do encounter cupping, contact us right away. At Wall2Wall, we are experts when it comes to flooring. Our dedicated team of experienced professionals are great at their work and utilize the most advanced and latest techniques to tackle your flooring issues and leave you with hardwood floors looking good as new! This entry was posted in Uncategorized on October 5, 2018 by Oregon Hardwood Floors.